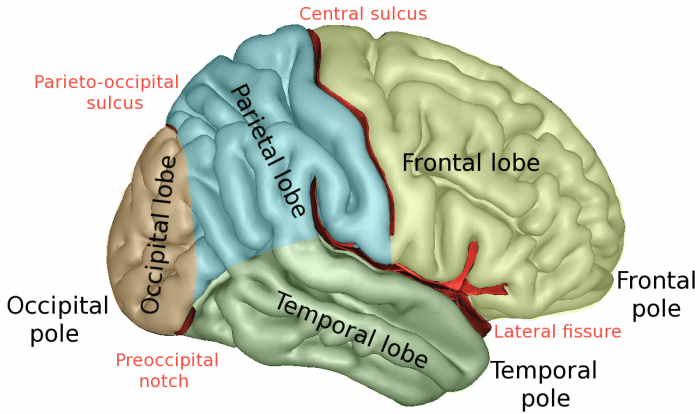 The parietal lobe is one of 4 main regions of the cerebral cortex in mammalian brains. Located in the posterior region of the brain, the parietal lobe mainly functions to integrate sensorimotor information from the different sensory modalities. The parietal lobe is the region of the brain that allows us to: localize the sensation of touch, assess objects in 3-dimensional spaces, be aware of our limbs and body’s position relative to each other, and coordinate arm movement for reaching and grasping. As I sit here right now writing this article, the parietal lobe is what allows me to reach for my Zelda coffee mug, raise it to my mouth and take a sip. Sections of the parietal lobe are also implicated in language comprehension and production. Several pathologies involve compromised function of the parietal lobe, including various aphasias, difficulty in motor control, and inability to judge spatial distances. Like all regions of the brain, cognitive functions cannot be mapped in a one-to-one correspondence with physical regions in the parietal lobe. Rather, the same regions of the parietal lobe can be implicated in a rather wide range of functions, some that do not seem to have any obvious overlap. Parietal activation is reported in a number of visuospatial tasks such as judging distance, reaching for objects, and mentally manipulating spatial representations, but also in tasks that do not obviously require visuospatial processing, like mental math or individual word processing. Perhaps one of the most important functions of the parietal lobe is touch discrimination. Essentially, the parietal lobe helps one localize a touch sensation, so they can feel the touch sensation in the right place, as opposed to the brain or all over the body. 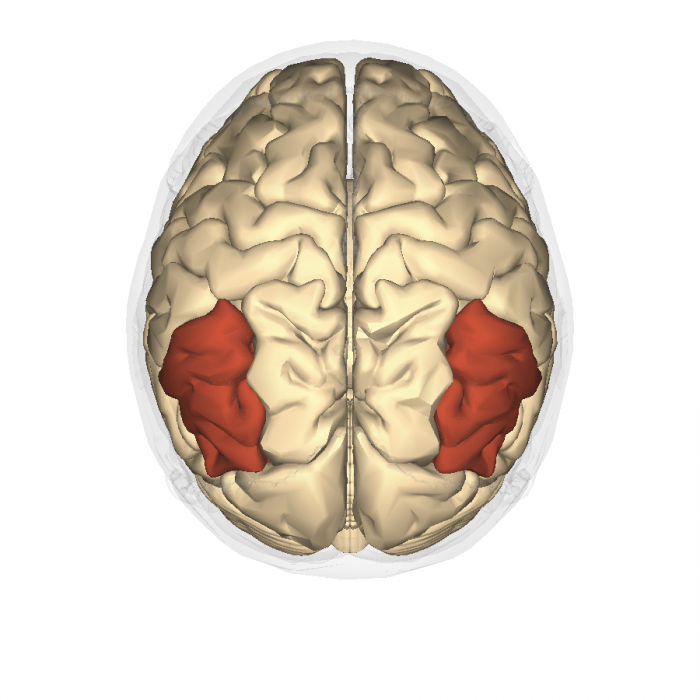 A large part of the surface area of the parietal lobe is dedicated to touch perception. As a general rule, the more sensitive a particular part of the body is to touch, the more surface area of the parietal lobe is dedicated to that part of the body. For example, the hands are a very touch sensitive part of the human body so consequently, a large portion of the parietal lobe is dedicated for processing sensory information from the hands. The sensory-motor cortex in the parietal lobe also helps us distinguish between the different aspects of touch, such as temperature or pressure. It is also thought that areas in the parietal lobe play a role in the perception of pain, specifically by modulating the intensity of the pain response and localizing a pain response to a specific area on the body. There is evidence that the destruction of the parietal operculum can result can result in decreased pain sensation and an inability to identify where pain is coming from on the body. Alternatively, direct stimulation of the same area can generate an acute pan response or trigger painful seizures. Thus, it is likely that the parietal lobe plays a role in pain perception insofar as it determines the location and intensity of pain. It is also theorized that the parietal lobe plays role in language processing. Brownsett & Wise (2010) report high levels of activation in the inferior parietal cortex when asking normal patients to engage in a written narrative as opposed to speaking, suggesting that the parietal lobe plays a role in written communication. This would make sense given the sensory-motor control required to write. Dronkers et. al. (2004) report that lesions in the parietal lobe, specifically the angular gyrus, can compromise language comprehension. Similarly, Simon et. al. (2002) report increased levels of activation in the inferior angular gyrus in normal subjects when performing tasks related to language and mathematical calculation. Perhaps one of the strangest pathologies involving the parietal lobe is associative aphasia. 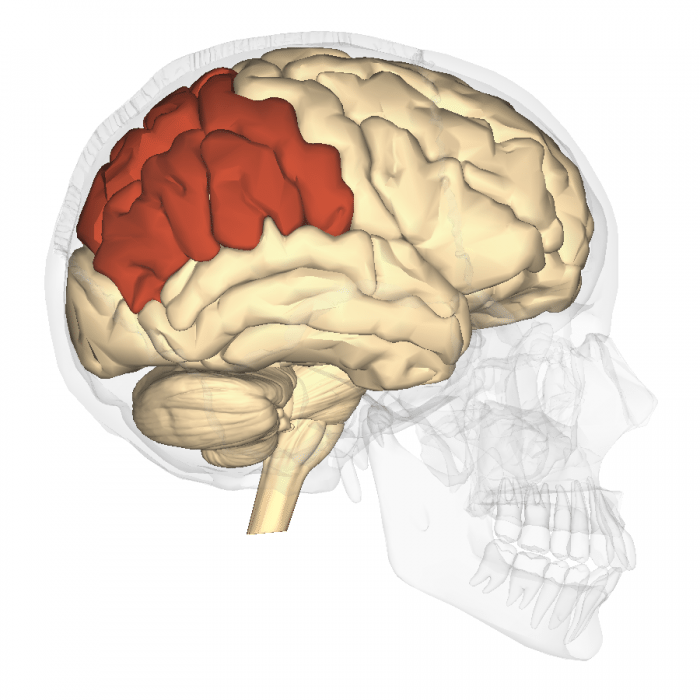 Caused by damage to a region in the left inferior parietal lobe known as the arcuate fasciculus, The arcuate fasciculus connects the Broca and Wernicke areas of the brain; areas that have been associated with language comprehension and language production. 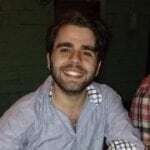 Patients suffering from associative aphasia (sometimes called conductive aphasia) are fully able to comprehend sentences from interlocutors but are unable to repeat the spoken phrase. Patients are able to paraphrase the meaning of the sentence even though they are nevertheless unable to reproduce the phonemes involved. It is thought that the damage in the arcuate fasciculus interrupts the chain of language processing that flows from the Broca’s area in the frontal lobe to the Wernicke’s area in the parietal lobe. The inability to produce the appropriate phonemes may have to do with the inability of the parietal lobe to properly match sensorimotor movements of the larynx and mouth to the cognitive meaning of a word. One possible explanation for the activation of the parietal lobe in a wide range of cognitive tasks is that the parietal lobe handles cognitive functions that are very abstract and general, and thus widely applicable. For example, Wojciulik & Kanwisher (1999) suggest that the primary function of the parietal lobe is “attention orienting”, an extremely general cognitive task that would be present in a number of processes. Both visual-spatial tasks and language production require attention, so it would make sense to see activation of the parietal lobe in those processes. Alternatively, it could be that the parietal lobe is just functionally heterogeneous and contains a number of distinct specialized regions. At this point, the verdict is still out and more research on the matter needs to be done.